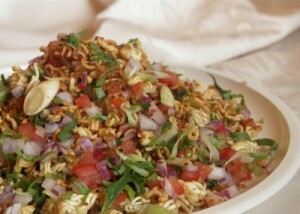 Bhel Noodles recipe by Habib Akhtar at DesiRecipes.com. It is Indo Chinese. Its Chinese ingredient gives a strange but lip smacking Indian twist. Bhel Noodles are Crispy Noodles with vegetables, tossed with sauce. When the seeds begin to splutter, add onion and fry for 2 minutes. Add curry leaves , green chillies and sprouted beans. Cover and cook till soft. After 8-10 minutes, add 4 cups of water. Add the Maggi noodles, masala cubes, red chilli powder and peanuts. After a few minutes, add capsicum, coriander leaves and lemon juice. Put in a serving dish and sprinkle grated coconut on top. its yummyyyyyyyyyyyy !!!! and Healthy also...............!!!! yummy i lov it so much...!! this loooks sooo good !